Were you in the chess club in high school? What about the A.V. club? What were you voted most likely to? Prom King? Prom Queen? Jock? Cheerleader? Waterboy? A member of the Plastics? Did you win the science fair? Did your report card show that you met or exceeded expectations? Was high school the best six years of your life? What if any of these distinctions made a difference in our ability to attract and engage people interested in working with us? Would we then consider listing them in our profile? Sure we would, if it meant landing that dream job or closing new business, but we don’t have to because there are other ways to present our strengths, experience, education and where and how we help companies achieve their goals. Some have referred to LinkedIn as a glorified job board or the online equivalent of the Chamber of Commerce. The market downturn of 2008 certainly was a factor in the site’s growth as more and more displaced workers turned to the site as an aid in the job search. The personal brand and thought leadership movements as well as the increasing pressure on salespeople to grow sales revenue were also factors that drove LinkedIn’s growth. The site has continued to evolve and can now be considered a content juggernaut with LinkedIn Today and their Influencer Program. They make it easy to find, share and comment on content via personal profiles and company pages, and it is content that increasingly plays a role in our ability to be found, stand out and influence people to connect and collaborate with us. I want to discuss several key areas of a LinkedIn profile and share thoughts on where and how you can make yours work better for you. You have three options when it comes to your LinkedIn profile picture: no picture (i.e. the grey ghost), the wrong picture (i.e. you from that wedding where you looked kinda nice and everyone is almost cutout but you can still see your date’s arm—or the one of you in your scuba gear in Cabo), or the right picture (a professional headshot). I am not suggesting you put a picture up from ten years ago, when you looked younger, thinner and maybe just better in general, like some people do on dating sites. I am suggesting a professional picture that shows that you “clean up good” (read “polished”) and can present yourself in a professional manner. If you are still using the “grey ghost” default image, please pause and think for a moment if you would actually do business with a grey avatar? Right! I didn’t think so. Many people have their title for their headline, and for a long time that made sense. However, the marketplace is increasingly competitive. People and companies have become less interested in your title and are instead more interested in what you can do for them. This translates into using your headline to convey the value you offer and where and how you can help. Basically, you are presenting your own value proposition to speak for you in your absence. A simple job title won’t do that for you. Let me caution you not to go too far, though. Some people go overboard with creativity and list titles like “Chief Cat Herder” or “Brand Sherpa.” Have you heard anyone say recently, or ever, “Thank God we found you! We’ve been looking for a Brand Sherpa”? I doubt people are actually looking for a Brand Sherpa or a Chief Cat Herder—unless, of course, they have a problem with cats. They are, however, looking for help, and ideally your headline serves two purposes: conveys where and how you can help them, and increases the odds of them discovering you. Updates published in the Activity section do more than simply tell people with whom you connected most recently. They show people what you have been up to in a broader sense. What was your latest presentation (slides included)? Regular updates serve to put and keep you on your network’s radar. They provide reasons to connect and communicate. I recently joined the board of a charity; when I updated my profile to reflect that, the likes and notes of congratulations followed. What is always interesting are the likes and comments that come from people with whom you have not spoken in ages; now you have a reason to reach out and reconnect. An added bonus is the fact that LinkedIn now shows you how activity updates such as the articles or blog posts that you have shared get re-shared and commented on. 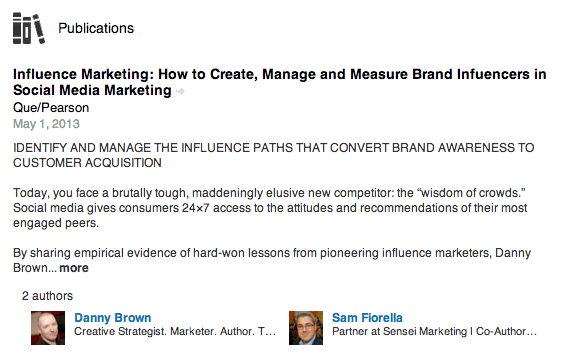 Often, marketers cannot state definitively who has seen their content and what the degree of engagement was, but LinkedIn now makes that possible. You know that moment during a job interview when someone says, “Tell me about yourself”? Well, your background or summary is that moment—in online form. It expands on the words in your headline. It provides more context and, hopefully, gives people a better sense of you. It is not your resume. Your roles, responsibilities and achievements come later, so focus on the who and why of you. This is not where you talk about your taste in music or movies or the fact that you like horseback riding and walks on the beach. It is not a dating site. And it is also not you talking about yourself in the third person like Jimmy from Seinfeld. Sell me on you, but don’t give me the hard sell. Lead with value. Give me a reason to connect and engage with you. Do we share similar interests and/or philosophies (and I am not talking about our mutual ability to translate Klingon)? If your summary was the only thing that could speak for you online, what would it say? Now I’ve got you thinking. The Specialties section provides you with the opportunity to group all of the keywords that are relevant to your profession, expertise, experience and your desire to be found. Compare the words in your profile to other profiles you admire and have found through search tests to see how yours stack up. Publications is a place where you can share where you’ve been published and illustrate your thinking, depth of expertise and thought leadership. People have shelves or even entire rooms dedicated to their high school trophies, and LinkedIn provides the online equivalent for publications, awards, certifications and more. Within the Skills & Expertise section resides the often-maligned Endorsements. While I, myself, have been critical of endorsements and the ease by which people and sadly, in some cases, near strangers can endorse you, you can’t deny the cumulative effect they have as they build up and project a picture of you and what you are capable of, which can only help to market you. The ability to incorporate media into your profile has gone from non-existent to somewhat cumbersome to rather smooth and easy. You can now embed videos, presentations and other media in key spots within your profile. People can read and/or watch your presentations, hear you being interviewed and come to understand more about you in a way no resume could ever achieve. Now, before any meeting or conversation, people get a sense of you, and trust and rapport building is already in motion. My suggestions are not the only ones you can apply to your LinkedIn profile or within LinkedIn to market you, get discovered or develop business relationships. Be sure to seek out the numerous other sources with tips and suggestions. There are too many to cover in just one post, but there are many that you will find helpful. As I mentioned, there has been a lot written about LinkedIn and Profiles, and this post adds to the pile, but I hope it gives you some things to consider about your own profile and inspires you to up your game. Let me add that my profile is not perfect! It is a work in progress and always will be. I constantly review and revise mine like a gardener waters and tends their garden. Make it a habit to regularly review your profile and update it. Your network will thank you—or at least “like” it. If you have other tips, ideas or strategies related to LinkedIn, we would love to hear them. 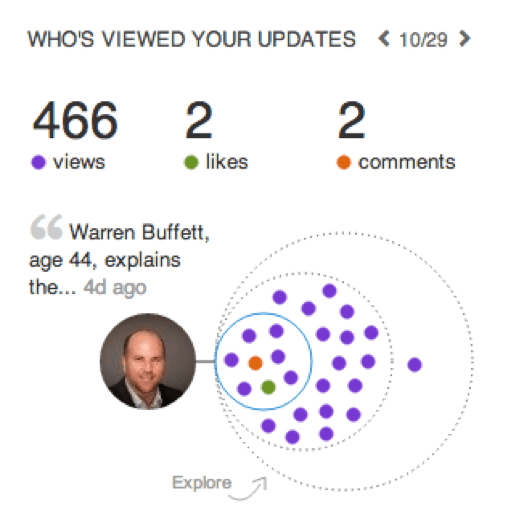 I’ll be the first to admit, my LinkedIn account is probably one of the networks I use the least. After seeing you talk about it last week, and the follow-up here, time for me to revisit, methinks. Cheers, mate! I was “Most Likely to Succeed”…seriously (because I know Amy and Danny are smirking). I’d show you the picture, but I look better now than I did then (receding hairline not withstanding). AmyMccTobin dbvickery Nah, I was the guy who would just up and walk out of class…had a teacher chasing me down the hallway saying I couldn’t do that. Told her there was nothing she could teach me, so I was going to go read the sports section in the library. I’ve gotten much more compliant with age…well, somewhat.